We work pretty hard around here to keep the toys down to a reasonable amount, but it’s amazing how quickly they can get out of hand. I’ve used some dollar store buckets in the past to corral some things, but they all broke fairly quickly. This time, we needed something sturdier. But I wanted to use every square inch of real estate, and these jute bins from The Container Store proved to be just the right size and shape. The brown ones I already owned; they store the things I don’t want my kids to reach without my help, like markers and play-dough. 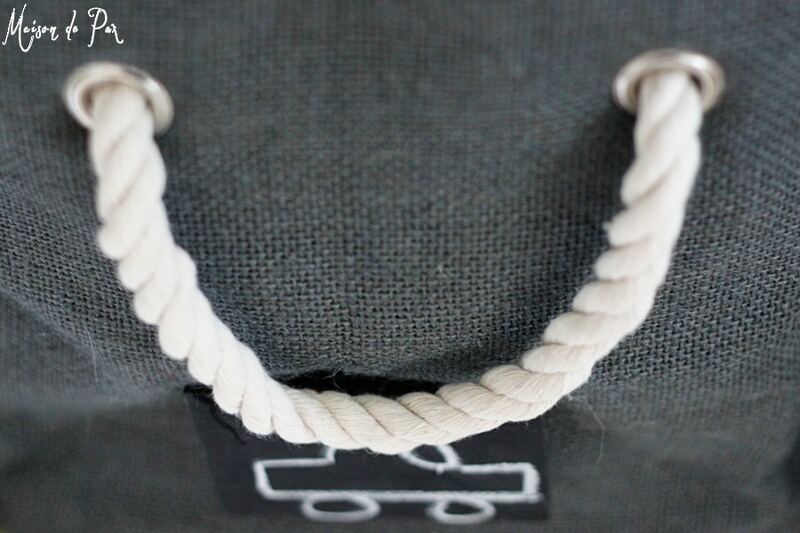 The best part are these sturdy (and adorable) rope handles. That and the chalkboard signs, but I’ll have to share the tutorial for those later. Though I originally loved my dollar-store fix, I think these will last much longer. And, honestly, I would use them anywhere in the house – I think they’re great. Cute! I wish we had a designated toy room but we don’t. Our TV room is kinda one but then there are buckets of toys in both kids’ rooms and books in our living room. Some day it’ll be organized! I love those baskets/bins. You’ll have to let us know how they hold up. I totally understand, Megan! No matter where the toys are, they need corralling, don’t they? 😉 I’ll keep you posted, but I’ve been SO pleased with them so far! 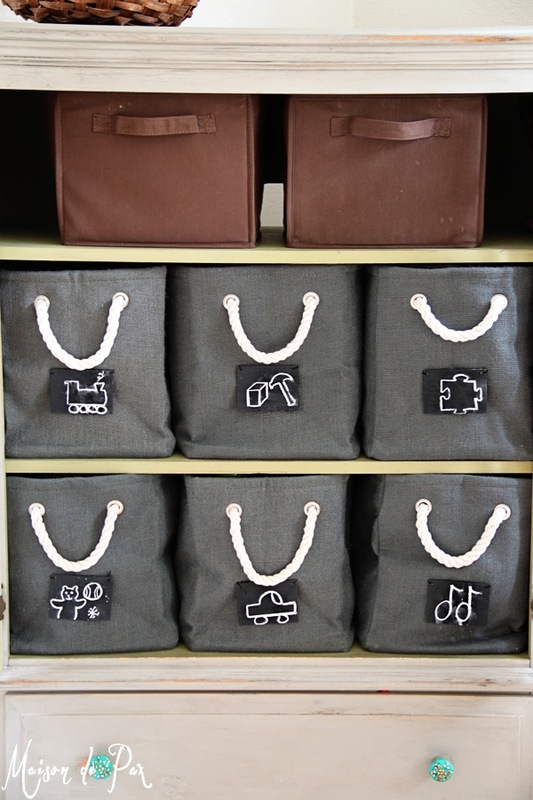 Great idea – you would never know toys were being stored there. Great find! Thank you so much! I love hiding the toys from sight. 😉 I’m so glad you like it, too! It looks so fresh and clean and fabulous Rachel- nice job!! 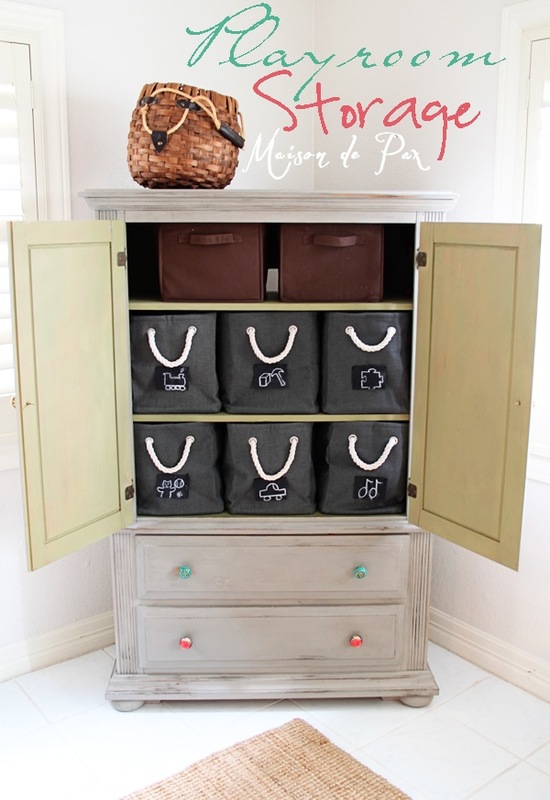 Love those bins and their charcoal color! I’m off to go see how you made those tags!! Wow. What a lovely furniture piece, first off. 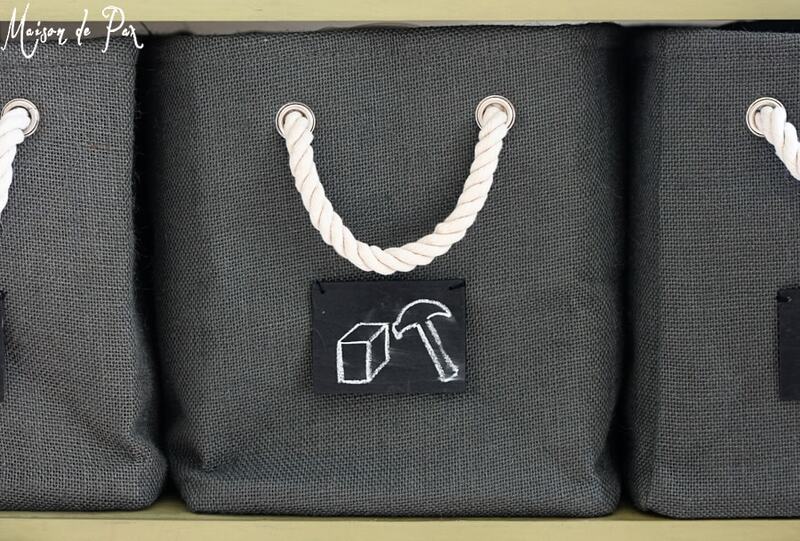 And those canvas bags with the chalkboard labels are just so perfect. I’m going to have to make a Container Store run! Thanks for sharing with us. I’d love for you to also share at our link party! Your toy storage loos so fabulous!! I am thinking this is th e bet use of an armoire since we got rid of tube-TV’s!! 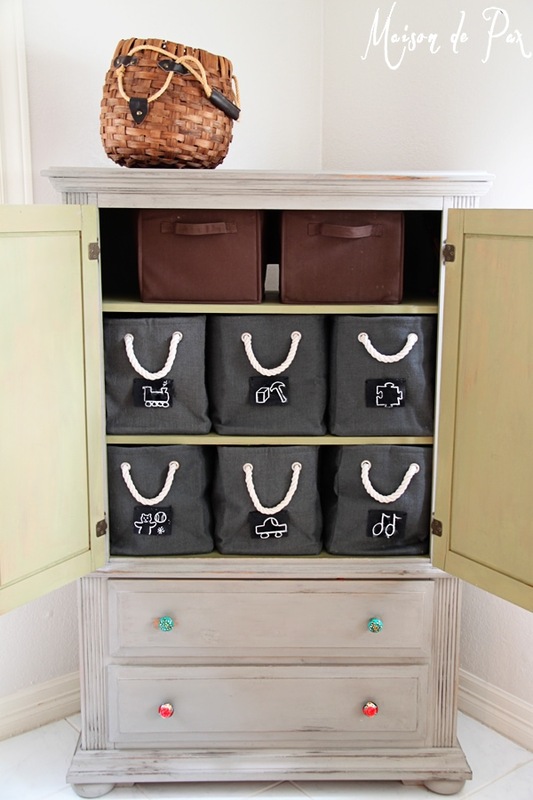 Love your solution for organizing and hiding the toys! Those black bags are great. Thank you so much, Melanie! I’m heading over there right now. I’m so glad you like it!! We always go through a toy overhaul/organizing blitz right after Christmas too. Your organization looks so lovely! So glad I’m not the only one. 😉 It helps this mama stay sane! I LOVE the paint color on your walls! Really in most of your house but especially in this room! 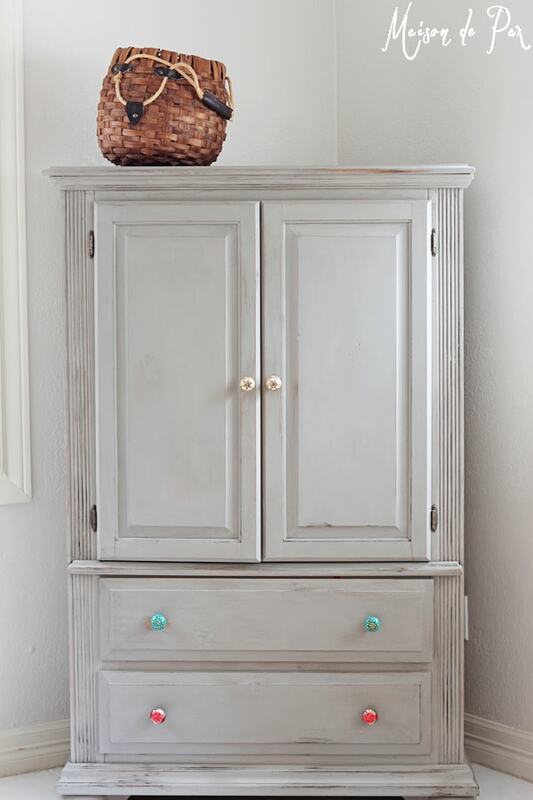 What paint/color did you use here? I looked around your site a bit but couldn’t find it anywhere. Thank you so much, Melissa! It’s Aesthetic White by Sherwin Williams. Hope this helps!